The Basset Hound Club of Southern California, Inc. holds two AKC licensed dog shows each year in March just for basset hounds. These are referred to as Specialty Shows. The shows give our members and other basset hound owners the opportunity to have their bassets adjudicated by licensed AKC judges in conformation judging. The judges base their decisions on the AKC Standard for Basset Hounds. Our shows are very prestigious for basset hound owners. The BHCSC Specialty Shows are among the largest such shows in the United States. Most years only the Basset Hound Club of America's National Show exceeds our shows in entries. At our BHCSC Specialty Shows we also hold events in addition to conformation. They can include AKC Canine Good Citizen (CGC), Obedience and Rally. These events are open to any purebred basset hound. 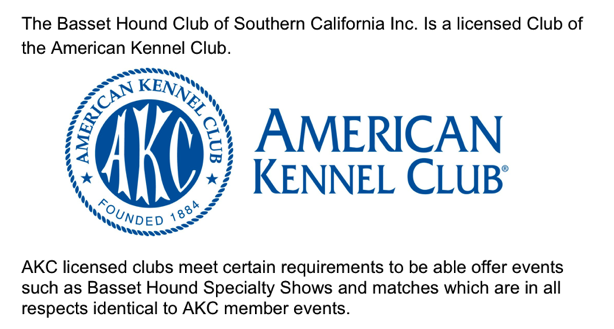 Even those bassets without AKC registration can be entered if their owners have obtained an AKC PAL/ILP number for them. There is more information on that here. Judging at shows is done by licensed AKC judges and is based on the written AKC Standard for our breed. 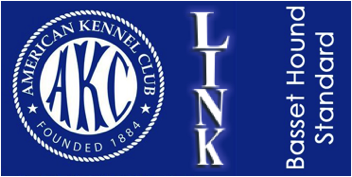 The link at the right will take you to the AKC Standard for Basset Hounds. You can also download and print a copy using the pdf link.